A delicious and refreshing Guava Mint Agua Fresca is the perfect complement to any meal. In my Mexican culture we like to prepare agua fresca with seasonal fruit to pair with the meals. Drinking agua fresca is a fresh delicious Mexican tradition as well as a healthy option to complement the daily menu. Offering guava mint agua fresca adds a portion of fruit combined with water with a little sugar to the intake. Honey, stevia or unrefined sugar like turbinado are often used to sweeten this drink. Watch the video and see how this recipe is made. A delicious and refreshing Guava Mint Agua Fresca is the perfect complement to any meal. This drink is made with Mexican yellow guavas, turbinado sugar, purified water and fresh mint. Clean the guavas with running water, cut the ends and slice in half. With a spoon remove the seeds and place the guava shells in a bowl. Add the guava shells to the blender together with the turbinado sugar, mint and water. Blend for a few minutes and pour into a pitcher. Add frappe ice to glasses and pour the agua fresca. Use a sprig of fresh mint to garnish. Replace the turbinado sugar with stevia for a sugar free option. For this guava mint agua fresca I am using Mexican yellow guavas that I found at my local market. It is incredible but in the last fifteen years the diversity in fruits and vegetables offered in my area has expanded considerably. And now the supply of fresh produce is much better than when I first came to live in this country. Situation that makes me very happy because I cannot live without vegetables and fresh fruits. I added to this drink fresh mint from my garden harvest as well as turbinado sugar to give it a rustic flavor. Then the agua fresca I poured into cute glasses filled with frappe ice. This guava mint agua fresca is delicious and extremely refreshing. Offering natural drinks is a good addition to the summer menu. Recently I prepared a barbecue at home where I served pork ribs with guava and chipotle. Accompanied by white rice and beans. And I placed on the table a pitcher of this fresh water of guava with mint, which is wonderful for this feast. Yellow guavas have a floral flavor and aroma. They grow in shrubs that can grow into medium-sized trees. This fruit I love because when I bring it home it is like bringing the aromas of Mexico to my kitchen. If you like Mexican food adding agua fresca to your menu is what helps to experience a truly typical Mexican homemade meal. 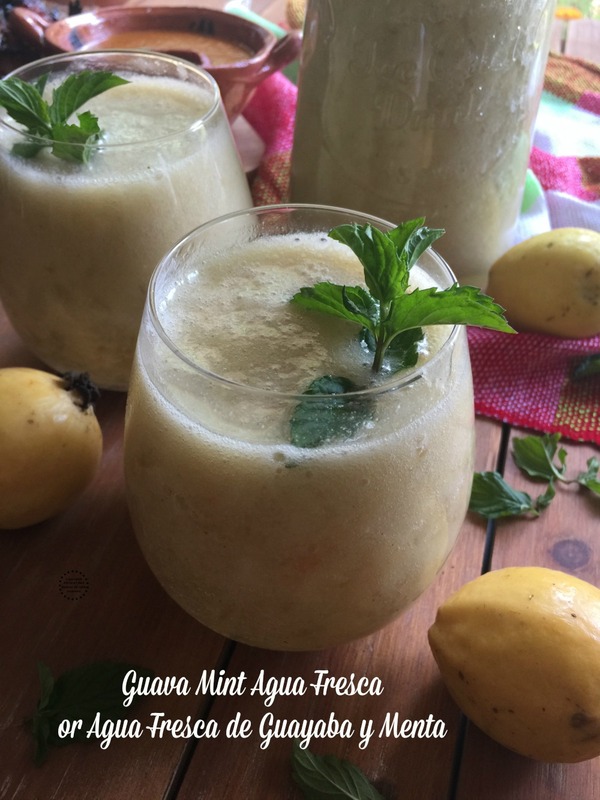 I love a good Agua Fresca and your guava mint version sounds delicious! Do you deliver? We can plan a cooking day I I will make it for you =) thanks for stopping by Chef Dennis! I love agua fresca! Your guava mint version sounds delish! This looks delish! I love trying drinks & dishes from other cultures & this looks like a refreshing drink for summer! Looks so good and refreshing. I’m sure my mom would love to hear about this too. Thanks for sharing this recipe! Looks like a nice refreshing drinks. I’ll have to give it a try. Have to go to the shops to find yellow guavas and tubinado sugar. Thanks for sharing. Your Guava Mint Agua Fresca looks so refreshing. This is a drink I would love to try. I’ve actually never tried an agua fresca (they aren’t really a thing here in Australia) but I’ve seen a few recipes pop up so I think it’s time to try! 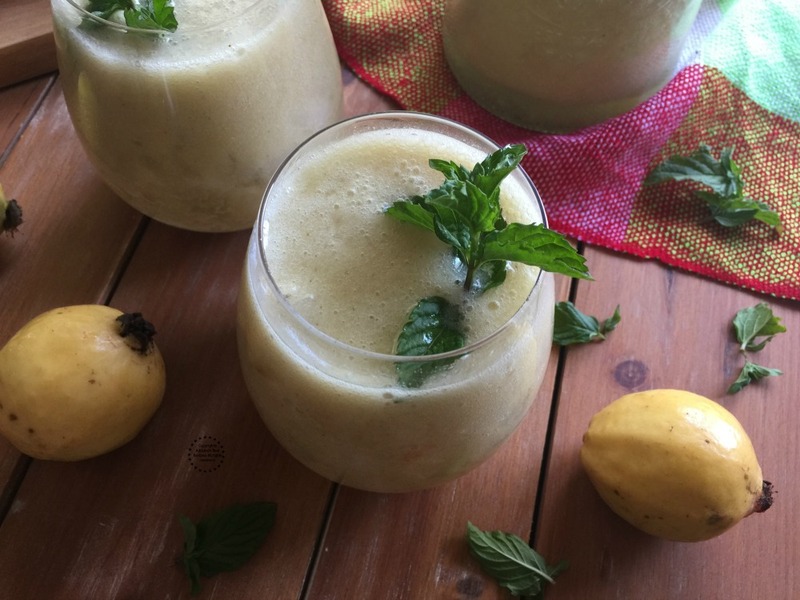 Will give this recipe a go – guava and mint combo sounds divine! I use Stevia in a lot of my recipes and I bet I’d love this one. I don’t know where to buy guava’s around here but you can bet I’m going to find out. I have never tried an Agua Fresca. It sounds refreshing and delicious! I have never tried guava so I cannot even imagine how this tastes, but I would definitely like to try it. I have always liked the taste of guava! I think this agua fresca looks and sounds SO amazing! It’s perfect for the summer. It’s the kind of drink you want to have while you’re sitting by the beach! This sounds so refreshing, and a summer must have drink! My mom’s favorite fruit was guava.!! She loved it so much we’d really love having a big variety of these juices and such. This reminds me so much of her. Yum. Wow for these hot days this would be great for my husband he loves stuff like this. I don’t think I ever tried guava but this does look good. I didn’t know agua fresca was a tradition. It looks very refreshing and it must have great health benefits. I love guava but never cook or make any cocktails with it at home, but your recipe is enticing me to finally take the plunge! This looks amazing! This si not a cocktail is an agua fresca to serve with the meal. But thanks for stopping by. I have never bought guavas. I love Mexican flavours…so this sounds like something I would like to experiment with. What a great drink for the BBQ parties this season. I don’t believe I’ve ever tasted agua fresca or for that matter a guava. Huh!! I think I’ve been missing out on some important experiences. The drink looks so refreshing — I’m definitely going to have to try it out!! I love agua fresca!! There are so many different combinations you can use, and this looks amazing! 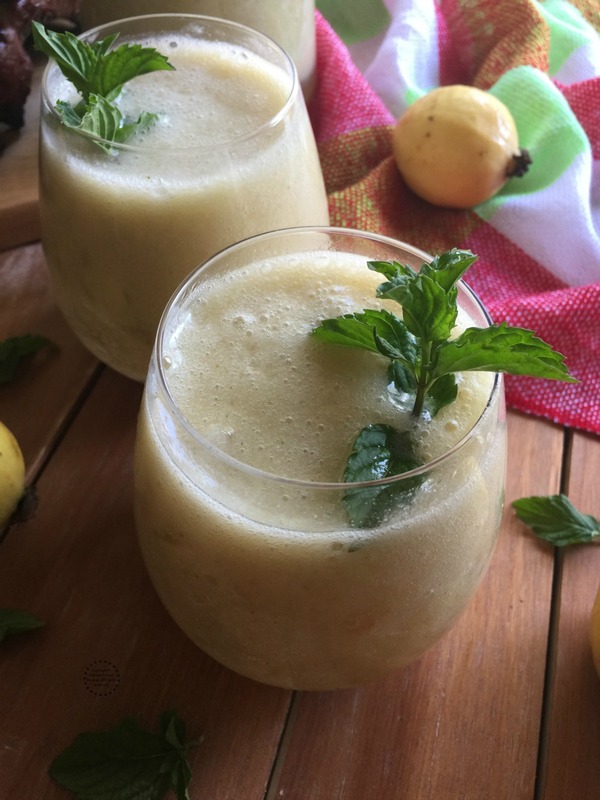 Mint is so refreshing and is the perfect balance to the sweetness of guavas. Guava and mint sounds like such a delicious combo! I’ve never tried agua fresca before but the thing is I see it on supermarket shelves all the time! A homemade version sounds much nicer though so thanks for the recipe! Yummy and refreshing! My kind of drink! Thanks for sharing! This is such a delicious combination and perfect for summers. 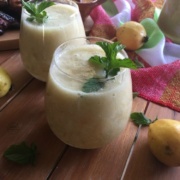 I do have some guava juice at home and I just need to get mint leaves to try this deliciousness soon 🙂 Love the recipe. In India we usually make Guava juice ,I love that food is connected in various parts of world. 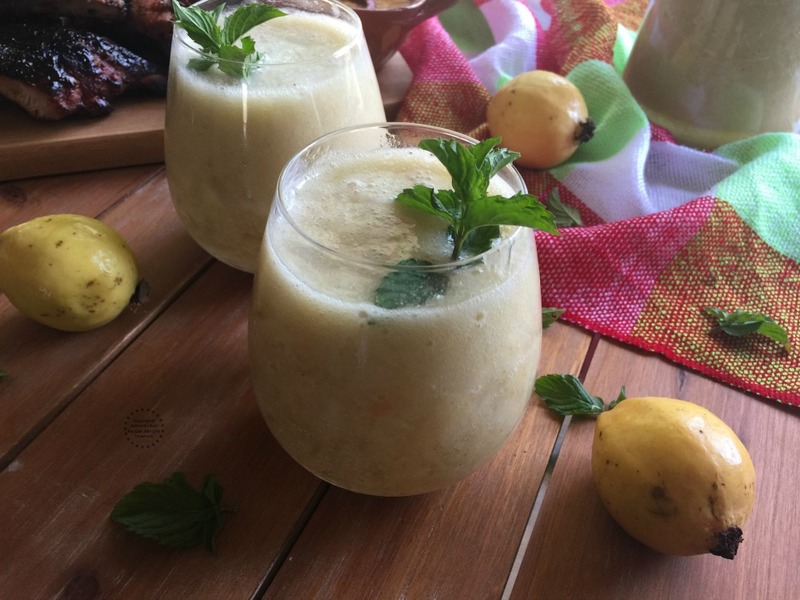 I like this guava agua fresca with guava and turbinado sugar I will give a try. I remember my school days we eat guava with touch of chili and salt as after school snack. I love guava but I have never had it in a drink..we usually just sprinkle some lemon salt and red chilli powder.. next time I get gauvas this is on my to make list.. looks and sounds super refreshing!! This looks so refreshing and healthy. I love anything with guava in it!